The Flying Scotsman. The ultimate pictorial record of how the world's most famous express locomotive steamed triumphantly into the Millennium, reborn with far greater power than Sir Nigel Gresley had ever envisaged. It is a story of financial nightmares and engineering excellence and it's told with the help of three men, her owner, the cheif engineer, and the traction inspector who was on the footplate at key moments. In BR days the engine, then numbered 60103, produced just under 33,000 pounds of tractive effort. But higher boiler pressure, bigger cylinders and improved steam passages all contributed to the Flying Scotsman improving that to 40,000 pounds. A professional TV documentary crew intensively filmed the engine in action during her first year back on the mainline. The result is a unique two part film, A Day in the Life and A Year in the Life, the star of them both is Flying Scotsman. 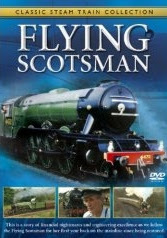 Classic Steam Train Collection - Flying Scotsman . Newburgh From The Air. Newburgh, in North Fife, Scotland, is situated on the banks of the River Tay. Newburgh has had a settlement or a village on the present site from a period much earlier than the end of the twelfth century, but it was at this time that the village grew in importance, due to the founding of Lindores Abbey, and was named in a Royal Charter as Newburgh. Labels: Tour Scotland, Scottish, Cottage Scotland Tour Scotland. 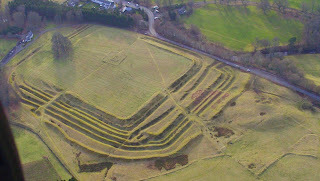 Aerial view of Ardoch Roman Camp. Not far from Auchterarder, and located near Braco, the Roman Camp is one of the largest Roman stations in Britain, with substantial earthworks dating from the second Century. Tour Roman Scotland. O, it's lovely roamin' in the gloamin'! A sure way to see the Loch Ness Monster ! 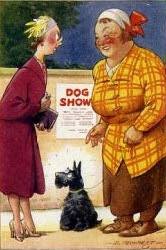 "You say they put Hamish amongst the Lady Dogs, was he highly commended ?" 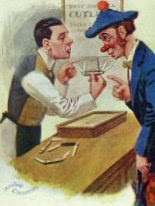 "No, but he was highly delighted." "What on earth has happened to your tongue, Sandy ?" "Well, Doctor, I spilt some of my whisky on a newly tarred road." Peat is the first stage in the transformation of vegetation into coal. For hundreds of years, Highland and Island Scots have cut, dried, and burned it for heating and cooking. This compact, dark-brown material contains about one third less heating value than coal. It is not uncommon to see peat-cutting on the Island Of Skye. 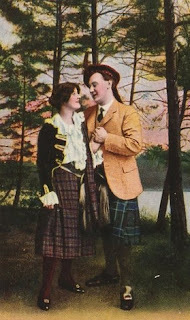 Scottish dress is often worn at black tie events, especially at Scottish reels and ceilidhs. While there is a more formal version which may be worn when the dress code is white tie, the black tie version is much more common, even at white tie events. 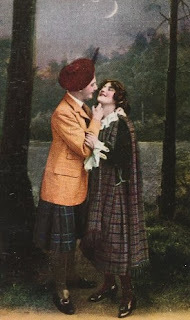 The traditional black tie version of Highland dress consists of: Black Prince Charlie jacket, Black waistcoat, Kilt, White shirt or Ghillie shirt, Black bow tie, Black Ghillie brogues, White kilt hose, Flashes. Other colours for both the Prince Charlie jacket, and the hose are seen. The Lowland version of black tie is a variation on normal black tie, with trews worn with a normal dinner jacket or Prince Charlie jacket. Trews are also often worn during the summer and in a warm clime. Anstruther is a small, but growing, town in the East Neuk of Fife, located nine miles southeast of St Andrews, Scotland. The village of Cellardyke, where I was raised, forms an easterly extension of Anstruther, and has its own harbour. Anstruther, as shown in the old photograph, was originally a very busy fishing village, and is now home to the Scottish Fisheries Museum, but its main industry is now tourism, although other small scale manufacturing and service industries continue. Pleasure craft now moor in the harbour, and there is a golf course. Waid Academy, the local school, where I was educated, also doubles up as a community centre. Anstruther Photographs. Here then is a journey around the Isle of Skye as it used to be between the 1890's and the 1940's. It is a voyage of frozen images from the past for the armchair traveller which unites it with the present in portraying the distinctive landscape and traditions of this compelling island. Skye Postcards. Tour Skye. Quaichs, from the Gaelic word cuach, have a rich heritage in Scotland, indeed, they are a uniquely Scottish invention. A traditional Scottish drinking vessel to offer a guest a cup of welcome and also as a farewell drink, usually a dram of whisky. Travellers were known to carry a quaich with them. Traditionally made of wood, it is a shallow circular-drinking vessel for whisky, with a pair of small lug handles projecting horizontally from opposite sides of the rim. The lugs, though functional, are of a unique carved style giving the quaich much of its special character. Quaichmaking was a highly regarded profession in 17th century Scotland. Quaichmakers probably made all sorts of wooden eating and drinking vessels, but took the name of their profession from their best work, much as workers in silver and gold called themselves goldsmiths. The Quaich in 1745 travelled with the Scottish Army in Bonnie Prince Charlie's canteen. Its bottom was made of glass so that the drinker could keep watch on his companions. A more romantic Quaich had a double glass bottom in which was kept a lock of hair, so that the owner could drink to his lady love; and in 1589 King James VI of Scotland gave Anne of Norway a Quaich or "Loving Cup" as a wedding gift. In more recent times, the Quaich has been used as a favour at many Scottish weddings, being presented to all at the top table. A symbol of the shared love and partnership between their hosts. Also at christenings (in Kilmuir in Scotland, there is a wooden quaich which was formerly used as a baptismal font, thus the quaich has become a traditional baptismal gift), or even births, to drink the health of a bairn and to share the love and celebration of that new life. It has a special place in the heart of all who know something of its history and is a prized possession of many people who have an association with Scotland. And will always be remembered in its traditional use as a visitor's welcome or farewell cup by proud clan chiefs, worthy merchants or humble crofters, and in this, the quaich has kept its simple but beautiful shape and friendly purpose. Collectable Quaichs. A short period of bright sunshine today. Took a wee drive to Maikleour village in Perthshire, Scotland. The road to Meikleour Hotel, Perthshire, Scotland, an almost unique Scottish country inn. Established 185 years ago. The Meikleour Beech Hedge, Perthshire, Scotland, is on the A93 Perth to Blairgowrie road, twelve miles north of Perth. It is marked on most roadmaps but is not signposted. "No lass, I won't be needing a menu." "This is an excellent knife, Sir, it has four blades and a corkscrew." "Sounds good, but do you have one with one blade, and four corkscrews." 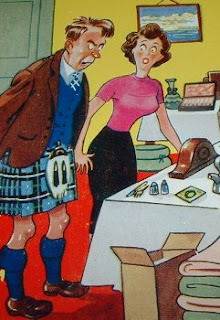 "I don't know who has been at your good Scottish Whisky, it certainly wasn't my husband Donald, for he tried and tried, but couldn't get the cork out." "We will have to cancel the wedding, Flora, the presents are just too disappointing." "You left your umbrella in the church last night, Donald." "Oh, that's where I was. I couldn't remember where I got to after I left the pub." "I can't clean the shoes downstairs, the Scotsman inside the room won't let go of the laces." "The food is perfectly fine, I'm just waiting for my wife to finish her meal, and then pass over the teeth." "If the wind is blowing too hard, and causing you problems, you can borrow these." 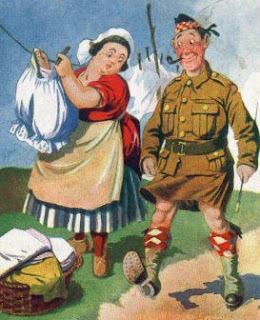 "I think the Corporal in the Laundry made a mistake when he returned our kilts." A natural fondness for ones birthplace is a common enough emotion. Scots, though, seem to have an incredible attachment to the land of their birth. It is "obvious" to all Scots that Scotland is the most beautiful country on the planet, and nothing will ever dissuade them of that belief. 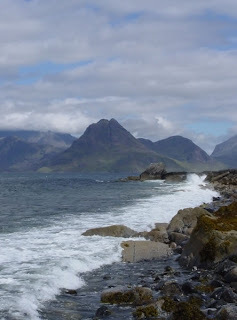 Native Scots, like myself, no matter where they travel, still feel the pull of the Lochs, Glens and Seascapes of home. Love of the land, of its proud capital city, of its country places, and islands remote and mysterious, is a strong vein in the Scot. He is the son of a hundred generations of warriors, and worships the chivalrous kings and fair queens and witty bards of bygone years and the lost causes and forlorn hopes and red defeats and hardships that fill the most precious pages of their story, nor is the ancient spirit of their fortitude and chivalry fled. Empire and the Great War are witnesses to that, and the Scottish soul dares yet wilder dreams of chivalry beyond all that ever was or can be, and stands fast for Freedom still, “though ever so poor,” ready to welcome pain and many a stark renunciation. By W. H. Hamilton. 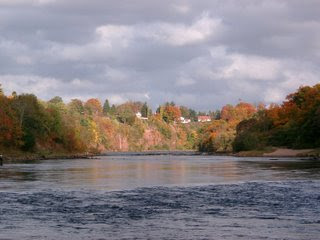 Lower River Tay at Stanley, Perthshire, Scotland. 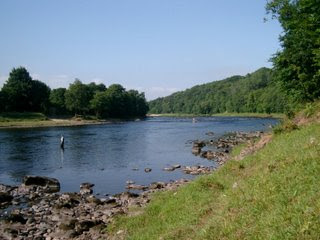 Benchil and Pitlochrie are amongst the most attractive beats on the Tay and are fished together on an alternative day basis from Monday 2nd July until the end of the season in October. During the period of Monday 30th April until Saturday 30th June both beats are fished from the Stanley bank only six days a week dependant on beat preference to the angler. The beats extend to some 2 miles of superb double bank fishing except during the period mentioned above. During the summer months (30th April to 9th July) the beats are fished from the bank by summer permits without the assistance of ghillies and boats unless requested. The cost of a permit during this period is £225.00 and should be applied for through the beat contact, however, individual days will be available as well. Also during the period of 7th May until 16th June a sea trout only permit is available at a cost of £50.00 subject to fly fishing only with the maximum of an 11'3 trout rod - again on application to the beat contact. Benchil is fished on both banks on Monday, Wednesday and Friday and Pitlochrie is fished on both banks on Tuesday, Thursday and Saturday from Monday 2nd July. The beats are situated about six miles from the top reaches of tidal water. Benchil fishes well in low water and Pitlochrie suits higher water. The fishing comes with two ghillies and 2 two boats on each beat. The owners are anglers and support the Tay District Salmon Fisheries Board Conservation measures and consequently would encourage all tenants to follow these guidelines. Benchil is situated just below the village of Stanley and is one of the most picturesque beats on the River Tay. 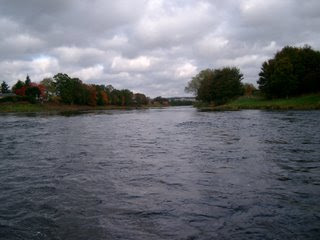 It is about five miles above the tidal reaches and offers many different types of pools to fish especially for fly. This beat can fish well in low water conditions during the summer and early autumns for grilse and larger summer salmon. It is also an ideal beat for sea trout fishing during May and June. Benchil offers an excellent opportunity for fly fishing in lower water especially in the attractive pools of the Long Shot, Little Shot and Lundie. The beat fishes six rods, has three boats and a fishing hut looking down the long shot. It has 10 named pools, including Skellies, Aitken Head, Plain Water, Ship Linn, Long Shot, Tail of Shot, Ewelundie, White Craigs, Little Shot and Todholes. Pitlochrie is situated in the village of Stanley up and down from the former Stanley Mills. This beat is very versatile in that it fishes well at different heights of water. There are good low water pools such as the Corner Pool, the Dyke and the Woodside and Horsey fishes well in higher water once the autumn rain arrives. The beat has nine named pools including the world famous Pitlochrie Pool and others including, Dyke side, Kirkie Stream, The Wash House, Cawnpore, Minister, Woodside, Horsey and the Tar Tank. This beat offers good bank fishing in all heights of water for fly fishing and spinning. It is also excellent for harling from the two boats provided. It fishes six rods and has a hut situated overlooking the Washhouse. George Stewart: one of the River Tay's real characters with over 40 years experience of these beats. Bob White: has over 20 years experience in angling for Atlantic salmon and has extensive fly fishing knowledge. He can offer tuition in overhead and Spey casting techniques. Tackle can be supplied contact beat for further details. Location; Lower River Tay, near Stanley, Perthshire, Scotland. 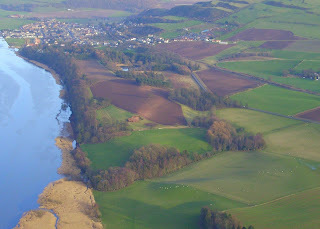 Benchil is situated just below the village of Stanley and is one of the most picturesque beats on the River Tay. Benchil Spring Fishing is about five miles above the tidal reaches and offers many different types of pools to fish. This beat can fish well in the spring in high water conditions as there is a large area of rapid water at the top of the beat thus making Aitken head a particular hot spot for resting springers. Benchil offers a good opportunity for fly fishing in lower water especially in the Long Shot. The beat fishes six rods, has one boat and a fishing hut looking down the Long Shot. has ten named pools including Skellies, Aitken Head, Plain Water, Ship linn, Long Shot, Tail of Shot, Ewelundie, White Craigs, Little Shot and Todholes. Five year average: 121 salmon/grilse, and 11 sea trout. Catholes double bank fishing, 13 pools, 1 boat, 1 hut. Luncarty Pool .5 mile bould bank fishing, 5 pools, 1 boat, 1 hut. Description. These beats offer a good variety of fishing during the summer and autumn months. Catholes is situated about 7 miles from the tidal reaches at the upper part of the village of Stanley. Luncarty is a small beat about 4 miles from the tidal reaches at the village of Luncarty. They are fished together on an alternative day basis from Monday 2nd July until the end of the season in October. During the period of Monday 30th April until Saturday 30th June the Catholes is fished on both banks on a Monday, Wednesday and Friday. Meanwhile Luncarty is fished on both banks on a Tuesday, Thursday and a Saturday from Monday 30th April until Saturday 5th May thereafter only on the Luncarty bank 6 days a week until Saturday 30th June. During the summer months (30th April to 28thh July) the beats are fished from the bank by summer permits without the assistance of Ghillies and boats unless requested. The cost of a permit during this period is £85.00 and should be applied for through the beat contact however individual days will be available as well. Also during the period of 7th May until 16th June a Sea Trout only permit is available at a cost of £50.00 subject to fly fishing only with the maximum of an 11'3 Trout rod again on application to the beat contact. Luncarty is fished on both banks on Tuesday, Thursday and Saturday and Catholes is fished on both banks on Monday, Wednesday and Friday from Monday 2nd July. Catholes: Offers a good variety of fishing with a weir crossing the river at the top of the Beat. The fishing is spinning and fly fishing from bank and boat in mostly small easily covered pools. It fishes 6 rods per day and has 1 boat and an excellent hut at the side of the river. Has 13 named pools including The Slap, The Pot, Gean Tree, Little Cast, Catholes stream, Black stones, back Dam, Lucknow, Eric's, Geoff's, Freddie's Woodside and the Little Head. Luncarty Pool is small beat of about half a mile long. It fishes well in high water but has proved a good resting place in low water as well. The mouth of the Shochie and Ordie burns come in at the top of the beat making an attractive stopping off point for passing salmon and sea trout. The beat makes for good fly and spin fishing from the boat in high water and from the bank in lower water at a very reasonable price in early season. It fishes 4 rods, has 1 boat and a fishing hut. The beat has 5 named pools including the Shochie, Big Stone, Eddys, Cadgers and the Willow. How to Book. Please take the availability link below and check that the rods you want are available. Then follow the instructions at the bottom of that page. The old churchyard at Cargill, Perthshire, Scotland. The parish of Cargill was created by the Bishop of Dunkeld in 1514. The original parish church was sited on the banks of the River Tay at Cargill. This is the driveway to Kinross House. You wouldn't want to be responsible for clearing the snow, or mowing the grass here. Kinross House, Perth and Kinross, Scotland, was completed with large gardens and parkland, by Sir William Bruce of Balcaskie in the years around 1690. The house is a private home, but the gardens are open to the public. Kinross Churchyard, Perth and Kinross, Scotland. The old parish churchyard is situated beside Loch Leven at the far end of the Kirkgate Park. The Bruce family vault is situated in the grounds. In the distance Loch Leven Castle is located on an island not far from the churchyard. Well, the days are slowly getting longer here in Scotland. 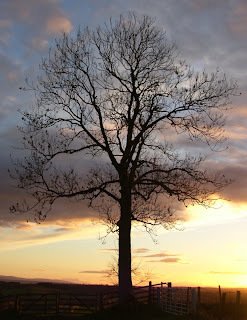 I took this photograph today, at exactly 5.15pm. Just seven days ago the road to Glen Quaich was impassable, just goes to show how fickle the Scottish weather can be. For those of you that have never visited Glen Quaich, do it, but best to drive the road in the Summer. If you have a head for heights and hairpin bends then the ten mile journey from Amulree to Kenmore on Loch Tay, through beautiful Glen Quaich is a must. The Glen Quaich road is a single track road with frequent passing places and quite a few blind summits, so careful driving is called for. 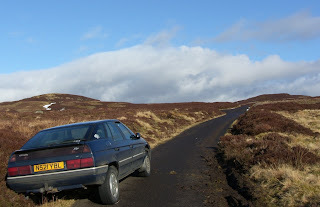 I got this far, and no further, as this abandoned vehicle blocked the narrow road. Nothing else for it, but to turn back. This is one place you do not want to get stuck in Winter, even on a beautiful day. Scrambled across the bog and heather today, to reach this wee waterfall in Glen Quaich. Scotland truly is a photographers dream come true. A deserted Scottish Croft in Glen Quaich. 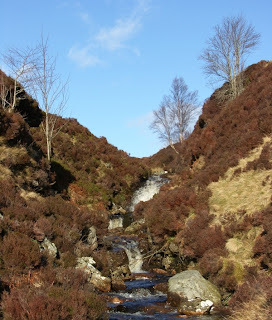 Until the middle of the nineteenth century this glen was quite populated; and then cleared of people, mainly to make way for Deer Stalking and sheep. The Marquis of Breadalbane was the man mainly responsible for the clearances around Loch Tay, and ultimately in this area as well. This is a beautiful glen, one that I normally visit on all my Tours of Scotland, and a good example of the terrible effects of the Highland Clearances. 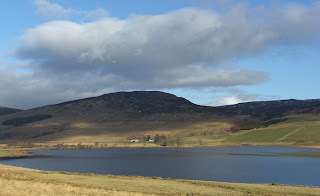 Loch Freuchie is located in a sheltered location in Glen Quaich behind the tiny settlement of Amulree. 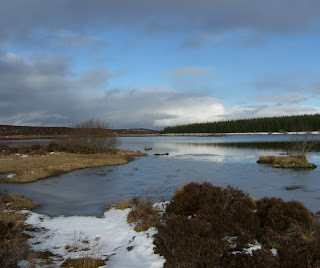 There is a pleasant circular walk around this small Scottish Loch. The loch is quite shallow but does offer good trout fishing, as well as excellent bird watching. Dating from the 18th century, Amulree Church is also worth a visit and has an information display on the colourful history of the area. In the early 1800s around three hundred crofters left the glen to resettle in Canada. After a three month voyage they colonised the Easthope area of Ontario and named their settlements Amulree and Glenquaich. I spent the morning in Amulree and Glen Quaich. Amulree is located nine miles west of Dunkeld on the A822 Road. 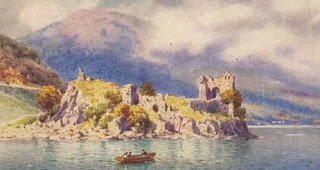 The history of Urquhart Castle and the glen on which it stands from its Pictish occupation to the arrival of industry in the 19th century and the legend of the Loch Ness Monster. Using the physical evidence from the site, author Nick Bridgland traces the development of castle and glen, chronicling the role it played in Scottish and regional history. Well illustrated with artefacts, paintings, maps and diagrams, it includes: Pictish occupation and culture; The spread of lowland Royal control into the region and the early origins of Urquhart Castle; Urquhart as a Highland prize during the wars of independence; The Battle of Ross; Decline of the castle in the 17th century; Highland risings, government forts and agricultural developments on the site during the 18th century; The 19th-century arrival of industry, the Caledonian canal, and the first siting of the Loch Ness Monster. Urquhart Castle and the Great Glen (Historic Scotland) . If I am in the vicinity, I like to drop in at Scottish churches that I haven't visited before. Fossoway Parish Church, Crook of Devon, Perth and Kinross, was built around 1727, and it has a most interesting churchyard. Crook of Devon was the scene of famous witchcraft trials in the 1660s, the Scottish witches being burnt to death. Scottish Folklore. Scotland's Churches Scheme. Many of Scotland's most important buildings re abbeys and churches, not just the great and expansive, but also the small and humble which are often found in the most beautiful and tranquil of settings. They all represent the rich cultural background of Scotland and the diversity of the nation. 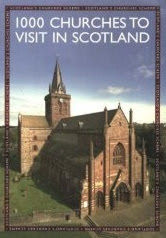 This is the indispensable guide to over 1000 abbeys, cathedrals, churches and other places of worship across Scotland. It is compiled from information supplies by the churches themselves, the from history and architectural details of the building to the availability of refreshments and other visitor amenities. It also includes times of services to access for the partially abled, location details, map references, and availability of souvenirs. 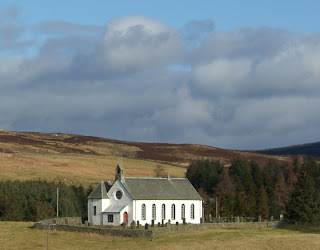 1000 Churches to Visit in Scotland . The National Trust for Scotland. (NTS) Membership will give you access to some of Scotland's greatest country houses and fortified castles, along with many of the nation's finest gardens and walks, plus the battle sites of Bannockburn and Culloden with excellent interpretative centres, and conservation sites such as Ben Lawers, Ben Lomond, Cairngorms and Glencoe. Contact -131 243 9555 for details, or write to NTS, Wemyss House, 28 Charlotte Square, Edinburgh, EH2 4ET. Scotland's Garden Scheme. Each year some 350 Scottish gardens, most of them privately owned, open their gates to the public under the banner of Scotland's Gardens Scheme. Founded in 1931, it is an independent charity and the money raised from garden visitors supports two main beneficiaries, the Queen's Nursing Institute (Scotland) and the Gardens Fund of NTS. Information form Scotland's Gardens Scheme, 22 Rutland Square, Edinburgh, EH1 2BB Tel: 0131 229 1870. Since 1945, when it acquired its first garden at Culzean Castle, the National Trust for Scotland has become the country's largest garden owner. Its properties include 35 major gardens together with another thirty that form part of other properties acquired for their architectural, historical or landscape importance. The gardens are notable for their range and variety, representing the full history of Scottish gardening, from the late medieval at Culross Palace, through the 18th-century picturesque at Culzean Castle and Victorian formality at The House of Duns to 20th-century plant collections at Brodrick and Inverewe. There are also many charming and intimate small gardens associated with notable Trust properties. Francesca Greenoak's scholarly but easily accessible text describes each garden in detail and discusses its design and plantings, its history, setting and historical and cultural connections. The Trust's policy for the restoration and conservation opf each garden are also explained. Full directions for getting there are provided together with information on access and opening times. The Gardens of the National Trust for Scotland . Perthshire Gardens Collection. A season ticket at offers entry to nine unique gardens, tickets may be purchased at any of the gardens in the scheme, which include Bell's Cherrybank, Drummond Castle, Scottish Plant Collectors Garden, Branklyn Garden (NTS Members will have free entry here), Blair Castle, Scone Palace and Glendoick Garden Centre. Scottish Explorer Ticket. Holders get unlimited entry to over sixty of Scotland's top heritage visitor attractions including Edinburgh, Stirling and Urquhart Castles. You can purchase a 3-day, 7-day or 14-day pass, or a family ticket. Telephone booking 0131 668 8664. The Great Houses featured in this book reveal Scots architecture in its grandest forms. The specially commissioned photographs by Christopher Simon Sykes include stunning close-ups of architectural details and objects, and capture the spirit and style of the houses, while Hugh Montgomery-Massingberd's refreshingly personal and informal text is as much about the families, who in many cases still live in these fascinating places, as about the architecture and decoration. The personal selection of twenty-six houses reflects the development of style in Scotland, from old tower houses, such as Cawdor through Baroque masterpieces like Drumlanrig and the pioneering Classicism of Kinross right up to the Edwardian opulence of Manderston and Ardkinglas. Great Houses of Scotland . Returned today to Perthshire, which is not the best known of Scottish regions, but it is one of the best areas from which to tour Scotland. Here are just a very few of the attractions in Perthshire. 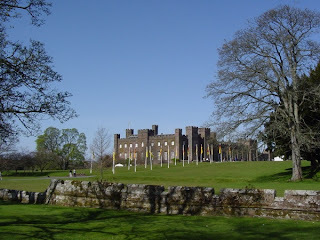 Scone Palace. 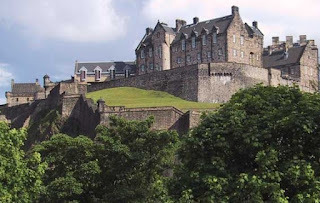 19th century restoration of 16th century and earlier buildings, the home of the Stone of Destiny now housed in Edinburgh Castle. Perthshire Visitor Centre. Tel: 01738-787696 Incorporating the Macbeth Experience, restaurant and shops. Castle Menzies. 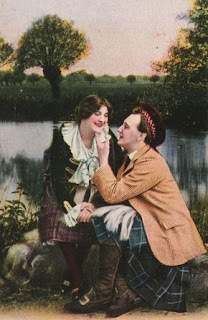 Aberfeldy. 16th century fortified tower house. Fowlis Wester. St Bean's Church 13th Century. 8th Century Pictish carved stones. Blair Castle. Turreted baronial castle dating from 1269. Home to the Duke of Atholl and the Atholl Highlanders. The Bruar Falls. 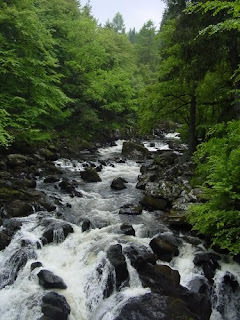 3 miles to the west of Blair Atholl River Bruar cascades down through rocky chasms and over great gleaming slabs of granite, once visited by Robert Burns. House of Bruar. Whether you're looking for the elegant country look or just a great family day out, House of Bruar has something for you. If you ever get past the food hall. The Pass of Killiecrankie and the Soldier's Leap. Splended wooded gorge with the famous Soldier's Leap, a 54ft jump made by one of Mackay's soldiers to escape from the Highlanders. Comrie Earthquake House. Built in 1874 to house one of the earliest seismometers in the world, still has a modern working instrument. Drummond Trout Farm and Fishery. Tel: 01764-670500 Feed the fish, enjoy the views and wildlife or catch your supper. Auchingarrich Wildlife Centre. Tel: 01764-679469 Lovely wildlife centre set in 100 acres of beautiful Perthshire hills. Abernethy Round Tower. Slender tapering tower, 74ft high, dates from the 9th century. Crieff Visitor Centre. Tel: 01764-654014 Craft centre well known for its paperweights and pottery. Drummond Castle Gardens. Tel: 01764-681550 One of the finest formal gardens in Europe. Created in the early 17th century. The Famous Grouse Distillery. Tel: 01764-656565 Scotland's Oldest Distillery. Home of The Glenturret single malt. Innerpeffray Library The oldest public library in Scotland, founded in 1690. Stuart Crystal. Tel : 01764-654004 Crystal and china emporium on the outskirts of Crieff. The Hermitage at Dunkeld. Mixed conifer and deciduous woodlands with folly built in 1758. Lovely walks, near Dunkeld. Loch of the Lowes. Nature Reserve where ospreys can be seen from a hide. Dunkeld. National Trust Houses and Ell Shop 20 Houses in Dunkeld dating from 1689. Balvaird Castle. Castle ruins used in the filming of Macbeth. Kenmore. The Scottish Crannog Centre. Tel: 01887-830583 Travel back in time 2,500 years to see how crannog dwellers lived. Killin. 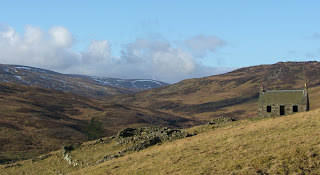 Ben Lawers, Perthshire's highest mountain (3984ft) with views from the Atlantic to the North Sea. Kinross. RSPB Vane Farm On the southern shores of Loch Leven discover the many variety of migratory birds. Loch Leven Castle. Castle ruins where Mary, Queen of Scotswas imprisoned in 1567. Muthill. Folk Museum Museum depicting life in the village from by gone days. 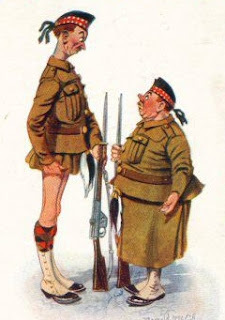 The Black Watch Regimental Museum. Tel: 01738-621281 Housed in Balhousie Castle, Perth. 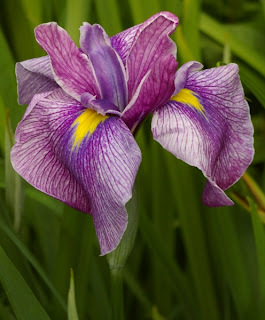 Cluny House Gardens. Cluny House, Aberfeldy. 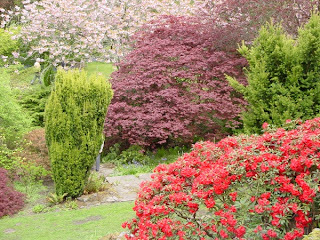 Woodland garden with many specimen trees, shrubs and rhododendrons. Kinnoull Hill Woodland Park. Woodland walks and views across Perth to the Tay and beyond. Perth Theatre. Perth's Repertory Theatre with restaurant and bar. Bell's Cherrybank Garden. Garden devoted to Scotland's ubiquitous shrub. Branklyn Garden. Wonderfull two acres of garden in the country. Perth Race Course. Tel: +44(0)1738 551597 at Scone Palace Park. Edradour Distillery. Tel: 01796-472095 Scotland's smallest distillery and last one to produce a handcrafted malt. Pitlochry Festival Theatre. Drama, concerts and foyer events. Spent another day in the area in which I was raised in Scotland. St Monans, Fife, Scotland. A very beautiful East Neuk fishing village, certainly worth a visit on any tour of Scotland. Interesting architecture and good walks abound. A wonderful village to photograph, or paint, or simply to relax in. I lived and worked in St Andrews for seven years, and often caddied at the Old Course to supplement my income. I know St Andrews very well. The Old Course at St Andrews, Fife, Scotland, is one of the oldest golf courses in the world. Tour St Andrews. The Swilcan Bridge, St Andrews Old Course, Fife, Scotland. The famous stone bridge, which spans the Swilcan Burn, was not originally provided for the convenience of golfers, but was part of an old route into St Andrews. Golfers cross the bridge on their final walk up the 18th fairway, and normally stop for a most memorable photograph. Golf Scotland. I spent the day in the East Neuk of Fife, including visiting the old fishing village of Cellardyke, where I was raised, which is a hidden treasure. It doesn't benefit from the tourist signs that elsewhere in the Kingdom of Fife that tell you where to go and what to see. And from the main coast road, the old heart of Cellardyke is well hidden from view. And Cellardyke's attractions are not confined to the harbour. The streets running south west from it, George Street and John Street, are crowded closely on both sides by cottages and houses, with those on their south east sides backing directly onto the foreshore. Tour Fife. This is George Street, a narrow, two-way street in the village in which I was raised in Scotland. Tourists tend to give these old fishing village streets a wide berth, but for locals, such as myself they are run of the mill. This street leads to Cellardyke Harbour, Fife, Scotland. 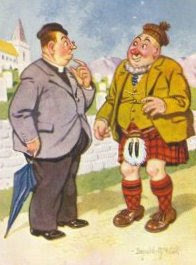 Tour Scotland. Anstruther Castle Street, Fife, Scotland. A narrow street close to shops and cafes in Anstruther. As a youth I spent many hours playing on the beaches around Anstruther. Anstruther Herring Drifter, Fife, Scotland. Fifie herring drifters like the Reaper were used during the nineteenth and early twentieth centuries on the east coast of Scotland. Anstruther, and the adjacent village of Cellardyke is where I was raised in Scotland. Spent the day north of Aberfeldy, Perthshire, Scotland. There weren't too many opportunities for good photographs, but the sun did come out at Loch Kinardochy which is a hill loch, located between the River Tay and the River Tummel valleys. The loch contains typical highland brown trout. Loch Kinardochy Photos. Schiehallion Mountain from South of Kinloch Rannoch. One of the most romantic and interesting mountains in all of Scotland. Schiehallion Mountain. A Scottish sheep above a small waterfall just off the Schiehallion Road in Perthshire, Scotland.